Every year during spring time we get lots of requests for our spring cleaning services from Lexington KY residents and business owners. It’s just a lot more convenient to have professionals do your spring cleaning chores. Because we have industrial tools we can clean a lot deeper and faster than a typical home or business owner can. This in turn saves a lot of money, and wouldn’t you rather be enjoying your spring anyway? What Does Spring Cleaning Include? The short of it is that it includes everything that you need to get your home or business into tip top shape so that you’re starting your new year by putting your best foot forward. It’s important that we make a great impression on our first go around for visitors and business patrons. That’s where our Lexington KY spring cleaning services comes in. Some of the items that we can provide in your spring cleaning estimate are listed below. Not everybody will need everything that we offer, but we do try to cover all of the bases. Our staff here at Centric Cleaning is friendly and approachable. Please use our contact us form, or for faster service feel free to call our office. We will get you scheduled for upcoming spring cleaning project ASAP. 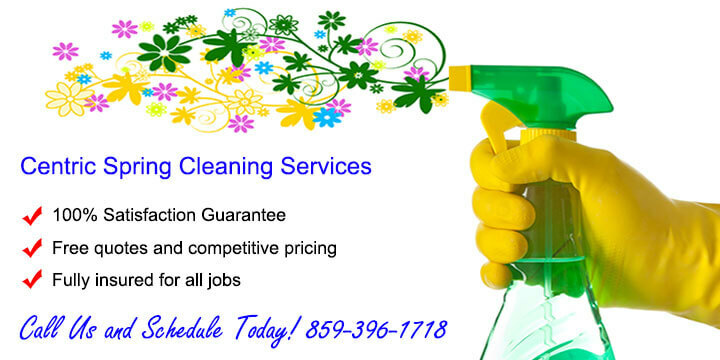 We also service Nicholasville, Georgetown, Richmond, Frankfort, and Winchester KY with our spring cleaning services. Call today!